Need help getting through the end of semester assessments and exams? It’s that time of the semester again where everything is due and the walls are closing in on your time to prepare for exams. Maybe you’re feeling like you have everything sorted and you manage your time well and get a good balance between study and other commitments. But for the majority of you I’m guessing that this is the dream and not the reality. When I was a student even when I felt like I had done all the right things during the semester this time always resulted in increased stress and the feeling of doom. So what tips have I got for you????? Well there are a number of past blog posts and apps on study planning and anxiety which you might find useful. Or you could have a look through some of our tip sheets on exam anxiety, balance, cognitive enhancement and the calm breath to name a few. Or if it all just seems a little out of reach you could take advantage of the webinar offered next Thursday 27th October at 6pm. I’ll be online at that time to present a 1 hour seminar on some time management skills and how to manage your anxiety and stress at this time. I will also then be available to answer some specific questions you might have in the hour after that one. If you are interested then register your interest here. Identity and Sense of Self Event – this is an opportunity to be part of a discussion about diversity, inclusive language and share in personal stories of the LGBTIQ community. It is being facilitated by Chris, a student at UON and whilst it’s advertised as a workshop Chris is keen for it to be more of a discussion. He has organised for members of the LGBTIQ community to be part of the discussion as well as having support services staff along for the discussion. If you are interested in is in the NUSA building on Tuesday 11 October from 2-3:30pm. The Hunting Ground Screening – again this is an opportunity to be part of a discussion around sexual assault and the documentary developed in America around sexual assault in colleges. Whilst it is being facilitated by staff at UON, the students at the residences have been actively involved in promoting the event. Staff from UON counselling, residences and health promotion will be on the panel as well as someone from Hunter New England Health Sexual Assault service and a student representative. So come along on Thursday 13th October at 6pm in The Richardson Wing Theatre and join in the discussion. October 10th is World Mental Health Day. This year the theme is around making a promise to yourself, a commitment to look after your own mental health and wellbeing. This promise can be anything that might help you look after yourself. It could be as simple as going for a walk in the park, or connecting with a friend for a catch up. Or it could be a little more complex and ongoing like starting a new activity or joining a team. For me my commitment today is going to be to turn off my computer for the night and be present with my family. Now this may seem simple to some of you but it would be like going to sleep instead of cramming the night before an exam. Of course my longer term commitment is about creating better boundaries between my work, family and social life. This is on ongoing battle and some of the time I get it right and others I don’t. 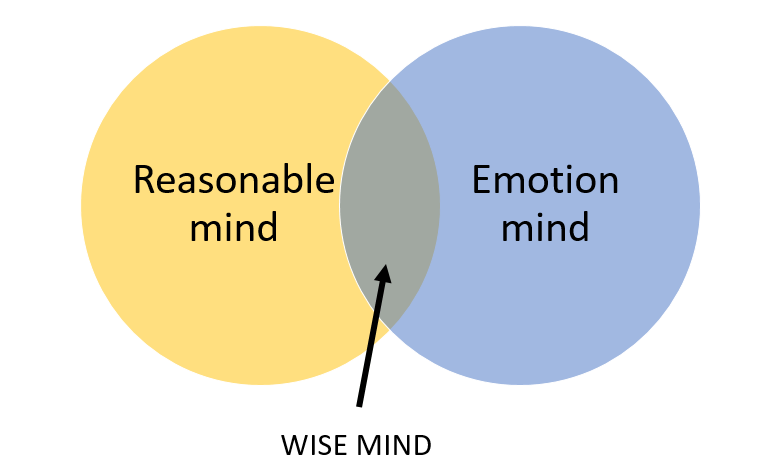 When the balance isn’t there I find myself feeling tired, getting frustrated and looking for the easy way out. So each day I try and look at what I can do for me in amongst all the other things I am committed to and the other roles I have. After all in addition to being me I am also a counsellor, a colleague, a daughter, a wife, a mother, a sister…..and the list goes on. So I have my promise to myself for today and my commitment to myself…what will you promise yourself? As we approach the busier end of semester in terms of assessment and study preparation I again find myself surrounded with requests from students for how to stop procrastinating. I’ve done previous posts on this topic and developed a tip sheet but I wanted a fresh look on things. So I went looking for a TED Talk on procrastination, which are far more interactive and fun…and let’s face it the procrastinator is all about fun over work. To my delight I found Tim Urban’s presentation and then read his blog about the same material. Tim gives great insight into the procrastinator’s brain as well as the reasons for why it’s hard to break the patterns…something about an instant gratification monkey and a panic monster ( I’ll leave Tim to explain these). He refers to tips for beating procrastination, some of which I’ve blogged about before including planning, setting goals, scheduling and making a timeline and then he talks about setting priorities and the struggle that the average procrastinator has with this task. So I thought that this weeks post should be about setting priorities using The Eisenhower Matrix. Eisenhower referred to these four different quadrants and said that you should focus on tasks in quadrants 1 and 2. Quadrant 1 should be tasks that you do now and quadrant 2 should be the ones you plan when to do. 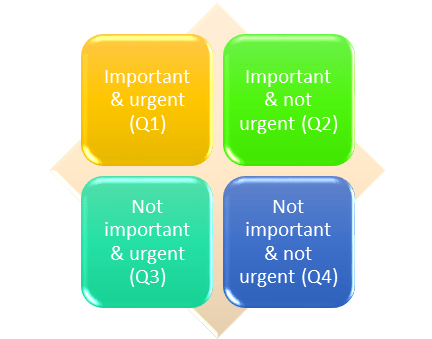 The tasks in the other 2 quadrants can either be delegated or deleted from the list allowing more time for those in the first two quadrants. So if you are making the lists of tasks and planning out steps and timelines then more time should be allocated to the tasks which are important and urgent and important and non urgent. Obviously what’s important to you will change depending on your values and goals, after all we are more motivated and more likely to engage in activities which are in line with who we are and what we are striving for. So with the risk that the procrastinator within you may be unleashed by watching a TED Talk take a minute out and look at this one. Identify with it, have a laugh but then get into planning, set your goals and prioritise them!